Popularized by coffee-table tomes and makeover shows, the Bali villa look is found all over the world these days. So it's no surprise that the combination of dark woods and handcrafted minimalism is becoming somewhat passé on the island itself. In fact, Bali's latest place to stay is more South Beach than Seminyak. 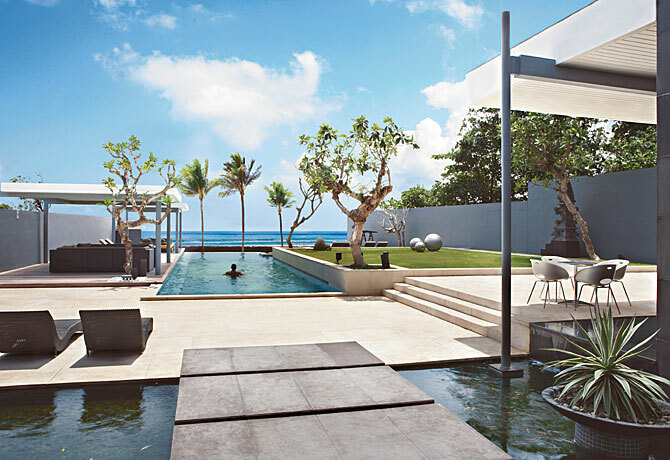 "We offer the next level of modernization for those who are tired of the modern Bali look but love coming back to Bali," says Melanie Hall, the owner of Luna2, www.luna2bali.com  a new, five-bedroom villa that is hands down the destination's most lavish address and features not a shred of batik. From the cool, Le Corbusier-like architecture to the Philippe Starck commodes, Pop Art paintings on the walls and the mosaic of Marilyn Monroe on the bottom of the 65-ft (20-m) pool, Luna2 is a hymn to Modernism. Even the villa's name references a 20th century icon  namely the first unmanned spacecraft to land on the moon. Facilities are suitably out of this world and include a lounge bar with its own signature cocktail (the Lunatini) and a surround-sound system; and a kids' playroom with video-game consoles, toys and DVDs. Two kitchens  headed by Danny Drinkwater, the former exec-utive chef of the Park Hyatt Sydney  turn out meals around the clock, while a staff of 23 ensures that you will want for nothing. A small security team keeps the paparazzi at bay. If the facility appears to blur the line between holiday villa and luxury hotel, it's supposed to. Hall encourages guests to think of Luna2 as a "private hotel," but adds: "Actually, we're not sure what to call it. Nothing like it has ever been done before." These kinds of rates haven't been charged before, either  at least not on Bali. Luna2 will cost you $4,000 a night plus 21% tax during peak periods (dropping to $3,000 in low season). That hasn't deterred the A list  Luna2 is already heavily booked  but as for the rest of us, well, maybe the traditional Balinese villa isn't so hard to live with after all.